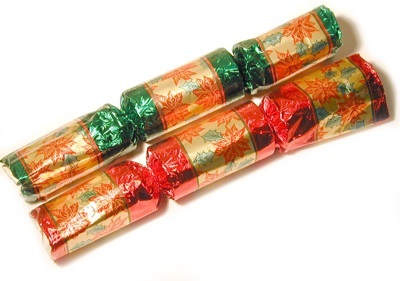 Christmas crackers are an important part of British Christmas celebrations. They consist of a cardboard tube wrapped in brightly-colored paper. 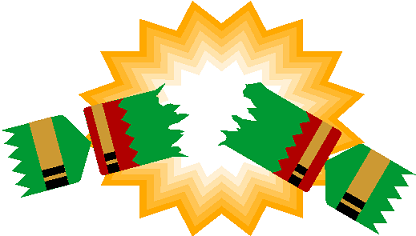 The ends of the cracker are pulled by two people (often at Christmas dinner), and the cracker splits into two uneven pieces, with a bang (caused by friction on a chemically impregnated card strip inside the cracker). Inside the cracker is a paper hat, a motto or joke (traditionally an unfunny joke) on a scrap of paper, and a small toy or trinket. Crackers were invented in 1847 by London confectioner, Tom Smith. Smith originally inserted mottos inside his sweet wrappers in an effort to boost sales. He later was inspired to add a "crackle" element after hearing the crackle of a log that he had placed on his fire. To incorporate the banger strip, the size of the wrapper had to be increased, and eventually Smith replaced the sweet with a small gift. Smith initially marketed the product as a "Cosaque" (Cossack), but the name Cracker quickly superseded it, especially when rival manfacturers brought rival varieties to the market.